Control valves are used in a wide range of capacity, from butterfly valves with a rated flow coefficient (KVs) of more than 50 000 m³/h, enough capacity to fill an Olympic swimming pool within three minutes, down to microflow valves with rated flow capacity that would take more than 20 hours to fill a glass of water. Typically, microflow control valves are globe valves with a seat diameter of 2 mm or less, where the plug is either parabolic or a V-notch type. The turndown ratio and control performance of such a valve is mainly dependent on the tolerances between plug and seat ring. Assuming a control ratio of 20:1 and following the rule of thumb that a KV of 1 m³/h corresponds to 28 mm² vena contracta area, on such valve trim the tolerance between plug and seat ring must be less than 3 μm. Besides the challenge to produce such high-precision parts, this kind of trim can only be used on clean process fluids and, due to the thermal expansion, only within a restricted temperature range. Arca’s new patent-pending approach is based on a rotary sliding gate valve, where two slices with lapped surfaces are installed in the valve pressed together by a spring and differential pressure. This enables zero-tolerance without any limitation due to thermal expansion. Each slice has one or more bores for the flow passage. Normally the flow passage of such sliding gate valve is only open when the bores overlap. Especially with small rated flow coefficient (small bores) this results in the on/off characteristic of the valve. 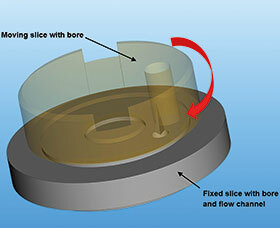 In this new design one of the slices is equipped with a tangential flow channel, which leads and expands into the bore of this slice. This enables a smooth control behaviour with sufficient opening angle (more than 60 degrees). The slices can be made of any material (even ceramics), which makes the trim resistant to process fluid and pressure drop. Although the valve plug movement is quarter-turn, a standard globe valve housing DN 15–25 rated PN16–PN 250 is used. This makes the design economical and allows changing from a standard valve to the new design, even in existing applications. First flow characteristic and critical flow factor FL measurements up to 150 bar differential pressure have proven the performance of this approach, even under pressure drops up to 250 bar.